Now I don't read many 40k books. I think I can count on one hand all the books I've read when it comes to the game. I'm one of those people who just thumbs through the Codex and gets the background I need for building my army out of there. It just so happens that I was out with my Daughter at the bookstore the other week getting her a new book (side note: if you have kids and they show the slightest interest in reading anything, get them whatever book it takes to keep them reading) and I happen to find this little gem in the Warhammer 40k section. Like I said, I don't usually read 40k books, but this one was about the Dark Angels and I thought, why not. So I picked it up on a whim. All in all, not a bad read. Starts off kinda slow but picks up towards the end as you start to see what's going on and put the puzzle pieces together for yourself. I suspect most 40k books suffer from something I realised towards the end though... there's only so many ways to write about Space Marines stomping the life out of their obviously inferior opponents who don't stand a chance. Anyone know of a book where the Marines get their teeth kicked in, let me know, I want to read that one. If you're a Dark Angels player, you may find yourself wishing you'd taken the time to build a Pre-Heresy force after you sit down and read this. I found myself either understanding or falling for another trap set by the bad guy (a captured Fallen Angel) as he explained what happened thousands of years ago to the Chaplain who was interrogating him over the course of the book. 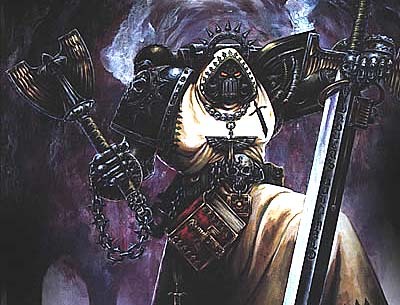 I like the problems the Dark Angels have now, they're flawed, but I find myself wishing the Legions were still the way they were before the Heresy. Thousands of men strong with one leader and a single goal. Back when they were the good guys and there was no doubt about it. well eisenhorn is actually 3 books about an inquisitor and although the space marines are incredible fighters they are all a bit dim witted and the inquisitors are really the stars when it comes to solving problems, which i really enjoyed. Eisenhorn actually kills a champion of slaanesh at one point! I really enjoyed this book, as well. The Dark Angels are one of my favorite chapters for the same reason that the Space Wolves are my very favorite: they're human. I'm currently reading Sons of Dorn and, while good, the Imperial Fists seem like robotic, brain-washed servants of the God-Emperor. The DA and SW, on the other hand, retain much of their humanity. Feeling, failing and fighting despite these. So if you ever get inspired again, check out the SW Omnibuses (omnibusi?). Hmmm, at one point when I was a kid my parents took away from me all my books because they were thinking I am reading and living in dream worlds too much. I guess this was my biggest disappointment as a kid. So you want books where Space Marines get their teeth kicked? Well, in this case the Blood Angels Omnibus and the follow up Red Fury is for you. However, we BA players (well, most of us, like 99%) find these books insulting because James Swallow doesn't really catch the spirit of our chapter at all and portrays them as a bunch of newbies in Power Armor rather than one of the oldest Chapters there is. We BA players are so disappointed that we have alarm bells ringing whenever we something with the name James Swallow on it. Red Fury is the slight better read of the two, though, so if you have some money to burn, you may go for that. The books by Anthony Reynolds, specifically they are a bout the Word Bearers, chaos I know, but 99% of the marines they face get 9 shades of crap kicked out of them. It's fantastic. Mainly his third book though, Dark Creed. Pretty good stuff if you like the hack and slash style of writing. Great review, couldn't agree more. Also I couldn't agree more with your point that Marine books suffer from them being far too good at their job, which I why I mostly read IG based books. I will recommend the recently released Rynn's World though. There is nothing more pleasing seeing the Crimson Fists really on the ropes and having to fight like hell just to survive! It's not a bad book, but I dislike the end a litle. Anyway it's nice to read something about the (not so?) Fallen, Cypher, and the hidden war between factions. If you read The Descent of the Angels (I don't know the exact english title) of the Horus Heressy and this book, you feel your're missing something in the middle as both books only make litle approaches to the events of the Heressy. Reading the two books you clearly can see the difference between pre and post Heressy DA. Brothers of the Snake by Dan Abnett; without revealing too much, they have huge problems with an ork invasion in that one. It is hard to believe you don't read all of the books! It goes to show the different motivations in 40k. I read the books and am inspired to paint and model. If thy stopped spamming the world with 40k novels I think the hobby aspect would diminish for me. In my mind a lot of the GW books are just naieve trash tailored toward making teenagers buy more models. there are some exceptions, pretty much anything written by Dan Abnett holds up as a decent read, in the gemmel vein, not challenging but a decent romp with well-drawn characters. that said the iesenhorn trilogy i'd reccomend to a non-40k fan, as long as they enjoyed sci-fi. they are great books and the omnibus is well worth picking up. I found two books out of the Horus Heresy series that look like they deal with the Dark Angels and I was thinking about picking them up. Ascent of Angels was one of them I think and I can't remember the other one off the top of my head. If you want some good reads, then then try Galaxy in Flames. It is a collection of short stories, where the marines don't always win. And the book isn't all marines either, there is IG, Chaos, xenos as well. One particular story is a really good curb stomping of marines and IG by some tyranids. Chaos takes a world in one of the stories. It's a great read, I've done it a few times, which is rare for me with 40k novels. I'd really recommend it.